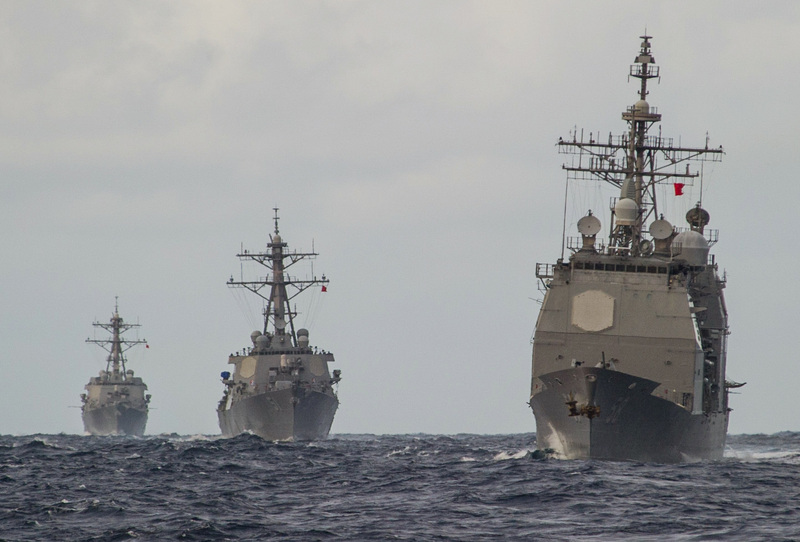 The evolving Distributed Lethality (DL) concept ––announced last year –– offers a new approach for how the nation might use its naval surface forces as potential adversaries acquire naval capabilities designed to control the sea. In some regions, confrontation could lead to crisis that could degenerate to conflict. There is cause for the Navy to worry. Many warships of potential antagonists have anti-ship missiles that far outrange the U.S. Navy’s weapons, and more advanced cruise and even ballistic missiles are in the offing. In late 2015 the U.S. Naval Surface Force’s only anti-surface weapons are the 60-nautical mile Harpoon anti-ship missile, first deployed in 1977, and 5-inch guns that can hold targets at risk out to about 15 nautical miles. Thus, the provision of long-range anti-ship missiles on U.S. cruisers and destroyers, littoral combat ships, future frigates, and possibly other ships and submarines could dramatically change the out-ranged challenge. 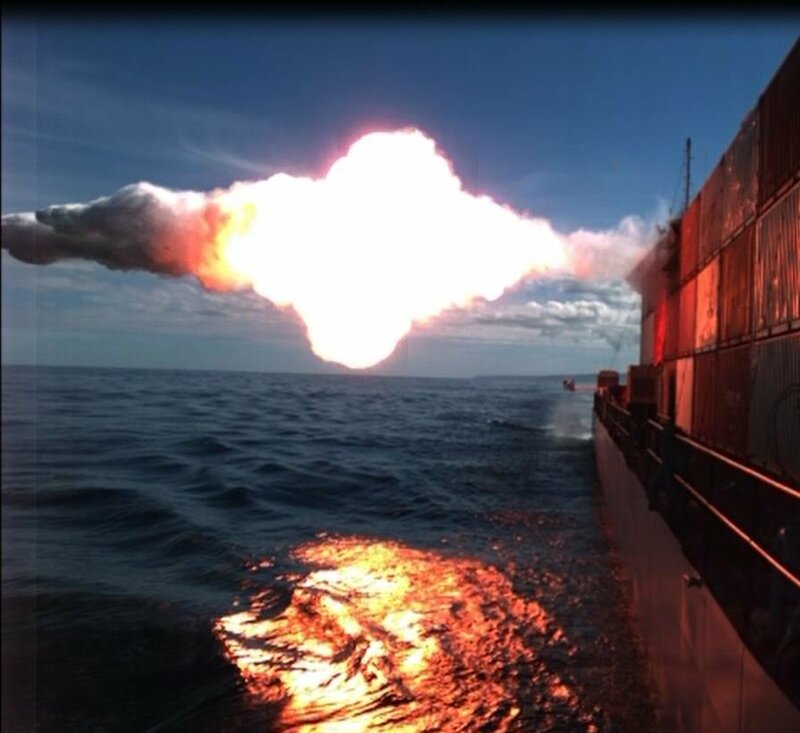 A long-range anti-ship missile previously existed in the Navy’s Tomahawk anti-ship variant, but the Navy took that weapon out of service because of long-range targeting issues. Those issues can now be solved. Distributed and more lethal naval and joint forces will enable and expand options for commanders in the face of existing and emerging sophisticated threats. Today, and certainly for the future, expanding the lethality of surface forces—which can be geographically distributed throughout maritime operating areas—will add another dimension to U.S. warfighting capability. Shifting naval surface forces to the offensive to conduct lethal offensive sea-control operations across the maritime battlespace will directly contribute to carrier/expeditionary strike group employment and deliver sea control in a range of military operations. “Indeed,” Bundy added, “distributed offensive capabilities will be the foundation for the surface forces’ contributions to conventional deterrence. DL III participants included representatives from the Naval Surface Warfare Force, the Submarine Force, 7th Fleet planners, cruiser-destroyer commanders and planners, Office of the Chief of Naval Operations resource sponsors, program executive officers and Naval Sea Systems Command program managers, and the DOD/Navy research and development community. Earlier DL I and DL II efforts focused on assessing and then expanding DL concept beyond last year’s U.S. Naval Institute and Surface Navy Association “rollout” framework. Operational and functional capabilities were identified and prioritized for further study and “deep dives” in areas needing additional analysis. Bundy explained that the three DL workshops focused on specific mission and task areas, e.g., offensive and defensive surface warfare in contested regions, coordinated offensive operations and independent surface actions were examined within operational and functional areas. Future workshops will provide deeper assessment of selected operational and functional capabilities within warfighting contexts and scenarios. The DL participants are informed on the problem set, possible contributing solution sets and presentations by subject matter experts. Breakout sessions are then conducted to assess combat operations or range of military operations scenarios where the problem or proposed concept can be assessed in detail. Workshops yield foundations of operational and tactical employment of existing, nascent and emerging science, technics and technology to address a warfighting challenge. Workshops offer opportunities to assess capabilities and concepts as well as build knowledge and commitment within a community of interest. “In contrast,” Bundy offered, “war games are used to assess campaign and higher-level operations where operational and functional capabilities are used to execute missions and tasks. War game participants experience the results of decisions made during execution of campaign and operational plans against a “live Red” with move adjudication. Workshops are used to develop and assess capabilities resulting in warfighting and wholeness concepts while war games allow commanders and staffs to experience the results of their decisions to employ forces and capabilities. “A specific focus of DL III was to examine the DL contribution to conventional deterrence,” Bundy said. The Naval War College has a history of helping naval leaders understand and operationalize new concepts, and the DL workshops are part of that lineage. We’ve identified several “low-hanging fruit” systems that could be incorporated into current and near-term surface assets to provide near term, opportunistic, and affordable lethality enhancements to existing weapons. And, a thorough understanding of capability and capacity of today’s surface force as well as the far-term 2030 force architecture will help prioritize initiatives that will inform investment decisions. The bottom line from the workshops is three-fold. First, increasingly capable A2/AD (anti-access/area-denial) weapons and sensors designed specifically to deny U.S. naval forces the freedom of maneuver necessary to project power have reached sufficient capacity to present high-cost/high-risk to U.S. forces. The baseline capabilities of our surface warships are insufficient to impose an equally high cost on the adversary. With the right adaptations to the current surface force, the capacity problem can be resolved and the U.S. Navy, combined with the Joint Force, can create a cost-imposing strategy against an A2/AD paradigm. Second, it is also clear from these workshops that the command and control and logistical sustainment of such operations are difficult problems that need to be addressed through further focused research. The Navy’s cruisers, destroyers, frigates, amphibious warships and submarines will be able to impose greater costs on potential adversaries at greater distances. U.S. warships armed with long-range, anti-ship missiles and torpedoes—in addition to their other combat capabilities—will make the U.S. Fleet of the 2030s and beyond considerably more effective in deterring conflict and more able to support U.S. interests––at costs that we can afford. 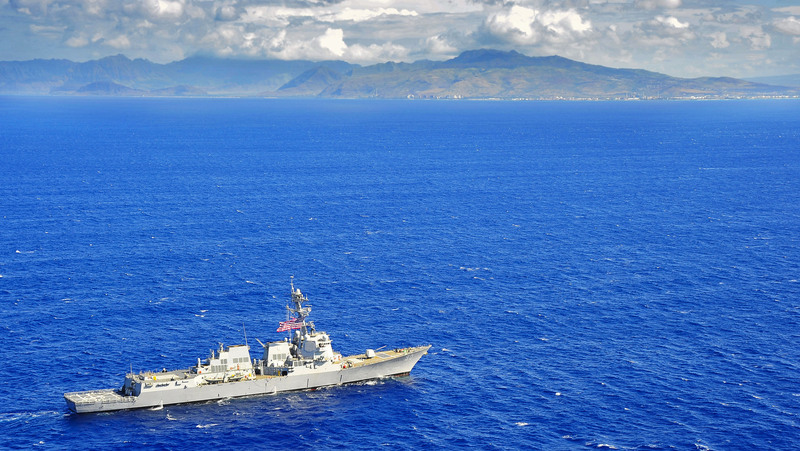 The U.S. and potential adversaries’ orders of battle included all current and near-term future surface combatants and offensive-sea-control weapons and systems. 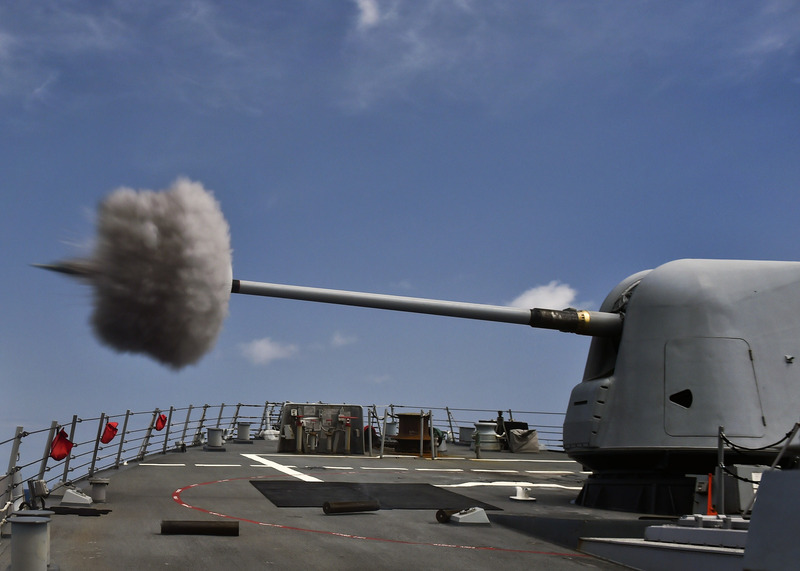 Near-term “up-gunning” possibilities include canister-fired missiles aboard existing cruisers, destroyers, and littoral combat ships. These include the Norwegian Kongsberg surface-to-surface 100-nautical mile range Naval Strike Missile, which in October 2014 was test-fired from the flight deck of the littoral combat ship Coronado (LCS-4). These weapons could serve as potential gap-fillers while the Navy procures a long-range, ship-launched, anti-ship missile to replace the Harpoon. In January 2015, the Naval Air Systems Command tested a modified Tomahawk Block IV cruise missile that received in-flight targeting data and successfully “attacked” a moving target ship operating off the California coast. If a follow-on anti-ship missile can meet Tomahawk dimensions, the weapon could be accommodated in the vertical-launch cells of all U.S. cruisers and destroyers. Tomahawks were carried in U.S. battleships, cruisers, and destroyers in armored box launchers that could be fitted in almost any type of surface ship. For example, sea control and power-projection enhancements inherent in the Design for Undersea Warfare, such as Virginia Payload Module-equipped Virginia (SSN-774)-class submarines as well as large-diameter unmanned undersea vehicles with mines and torpedoes, bolstered the combat power of the fleet via a wider distribution of more lethal assets. The idea that such operations from SSN forces creates alternate lines of attack and influence, thereby injecting uncertainty into an adversary’s plans, continues to open avenues for new conventional deterrent options.